Description: Shell sculptured with two rows of strong nodules on centre of body whorl and one row at lower third of spire whorls; whole surface overlaid with fine spiral cords and irregular axial growth lines. Columella wide, smooth, outer lip thin and simple. Colour grey, nodules fawn or white, aperture fawn or brown with two white bands within. 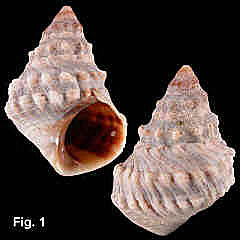 Operculum corneous. Size: Up to 26.8 mm in length; commonly less than 15 mm. Distribution: Endemic to Australia: Yeppoon, Queensland, southwards to Mallacoota, Victoria; also Lord Howe Island and Norfolk Island. Habitat: On exposed coasts and moderately sheltered shores, near and above high tide level, sheltering in pits and crevices. Specimens have been recorded living at 10 m above the high tide mark. Abundant. Remarks: This species has been described in detail by Reid & Williams (2004). Until recently this species was considered to have a wide Indo-West Pacific distribution, but it is now recognized that two species, in different genera, exist over this range. Echinolittorina trochoides (Gray, 1839) occurs in the tropical Indo-West Pacific, in eastern Australia reaching as far south as Hervey Bay. N. pyramidalis occurs from Yeppoon southwards to eastern Victoria. Both species are uncommon where their ranges overlap. The larger, broader shell and produced anterior lip of N. pyramidalis are the most useful shell characters to distinguish it from E. trochoides (Reid & Williams, 2004).